Hundreds of whales die in mass stranding on New Zealand beach - The Maghreb Times ! Rescuers are trying to save dozens of whales after a mass stranding on a New Zealand beach thought to be the largest in decades. The Department of Conservation (DOC) discovered 416 pilot whales had beached themselves overnight at Farewell Spit in Golden Bay at the top of the South Island, with more than 70% dying by the time dawn broke on Friday. DOC staff and dozens of volunteers were on hand on Friday morning trying to save the remaining 100 whales. As the morning wore on, an urgent plea was issued for locals to drop work and school commitments and head to the remote beach to save the whales, bringing towels, buckets and sheets to keep them cool, calm and wet. Andrew Lamason, a team leader for the DOC Takaka area, said the stranding was the largest in living memory, and although he had “no clue” why the whales had beached themselves this time, Golden Bay was conducive to strandings because of its shallow bay, which made it difficult for whales to swim out once they’d entered. At high tide, at 10.30am, the 100 remaining whales were successfully refloated, but early in the afternoon at low tide 90 of them re-beached themselves. DOC staff and up to 500 volunteers are now focused on keeping the surviving whales as healthy as possible until the next high tide at lunchtime tomorrow. Lamason said it was common for whales involved in a mass stranding to re-beach themselves, because they were social animals and would stay in close proximity to their pod, the majority of which were now lying dead on the beach. 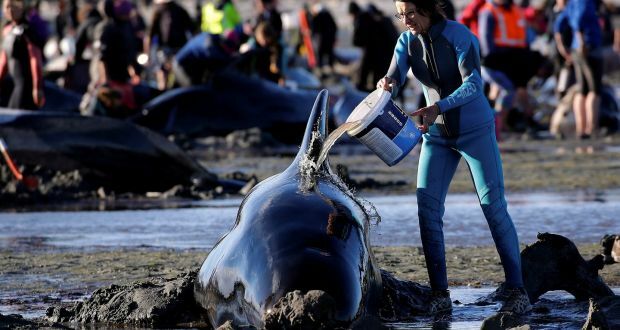 Lamason said whale strandings, which were common in Golden Bay, were an emotionally exhausting event, and anyone who wasn’t fit and strong and equipped to cope with the trauma were advised to stay away from the beach and not participate in the rescue effort. “It is cold, it’s wet and some of us have been in and out of the water for nine hours now, we can only cope with robust volunteers, not ones that are going to break down, which happens quite often.” he said. The beach was still littered with the bodies of the nearly 300 dead pilot whales which died overnight, but plans for disposing of their bodies naturally at sea were on hold while rescuers “concentrated on the living”, Lamason said. The stranding at Farewell Spit makes it the third largest whale stranding in New Zealand’s recorded history. In 1918, 1,000 whales beached themselves on the Chatham Islands, and in 1985 450 stranded at Great Barrier Island off the coast of Auckland. According to Project Jonah, a whale rescue group, New Zealand has one of the highest rates of whale strandings in the world, and on average about 300 whales and dolphins beach themselves on Kiwi shores every year. The reasons for whales strandings are still unclear, but it is thought a combination of factors contribute, with old, sick and injured whales being particularly vulnerable. Navigational errors among pods are also common, especially when chasing food or coming close to shore to avoid predators such as orcas. Since 1840, more than 5,000 whales and dolphins have beached themselves on New Zealand shores according to DOC records. Strandings occur year round, but usually involve only one or two animals. DOC respond to about 85 events a year, usually involving just a single animal.